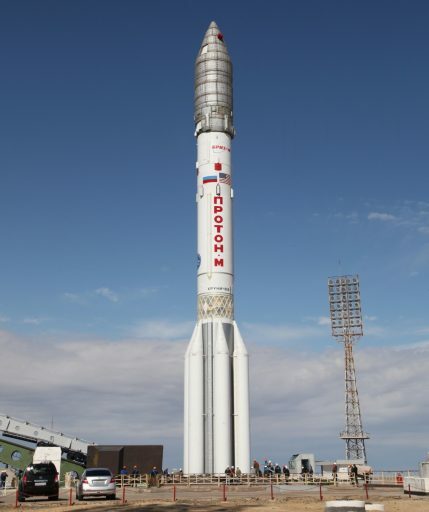 Russia’s Proton-M is standing tall atop its remote launch pad at the Baikonur Cosmodrome for liftoff Thursday night on the rocket’s second commercial mission of the month, tasked with deploying the heavy AsiaSat 9 communications satellite to a Geostationary Transfer Orbit. The 58-meter tall Proton is targeting liftoff at 18:52:16 UTC, 12:52 a.m. local time on Friday, and will head out to the north east with its three stages in action for just under ten minutes to dispatch the Briz-M upper stage on a nine-hour climb into the desired elliptical orbit. 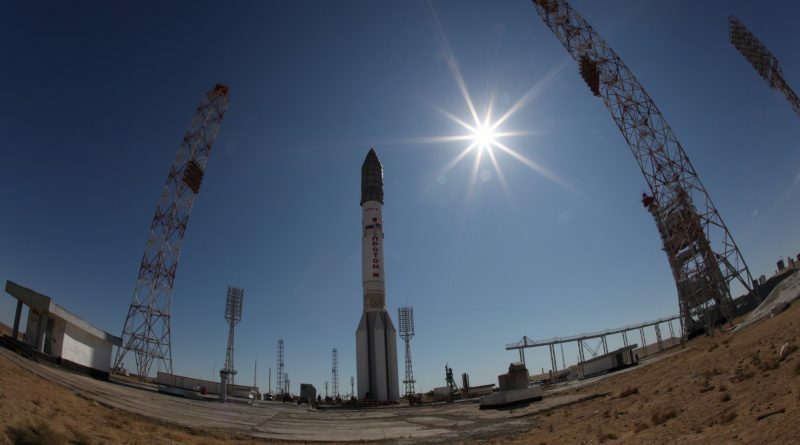 Thursday’s launch will be the fourth Proton-M mission of the year after the vehicle returned to flight in June after systemic engine issues forced the heavy-lift workhorse to stay on the ground for a full year. It will be the third and final mission conducted by International Launch Services this year, coming right on the heels of the successful Amazonas 5 launch on September 11. One more mission remains for Proton in 2017, targeting a December liftoff with the second Blagovest communications satellite operated by the Russian Ministry of Defence. 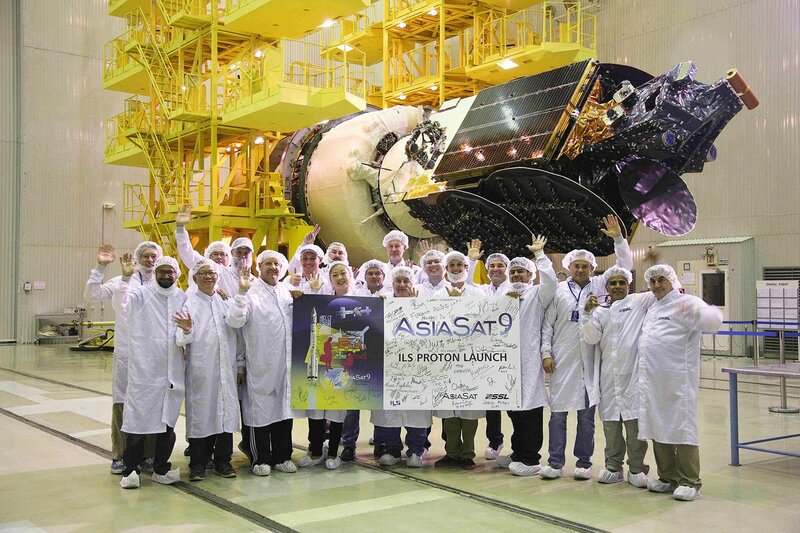 AsiaSat 9 is the tenth satellite commissioned by Hong-Kong-based Asia Sat, a large telecommunications provider in the Asia-Pacific Region. Built by Space Systems Loral in California, the satellite weighs in at 6,140 Kilograms and is destined for an orbital position at 122.2 degrees East in Geostationary Orbit where it will replace the Boeing-built AsiaSat-4 that launched in 2003 and is approaching the end of its planned service life. 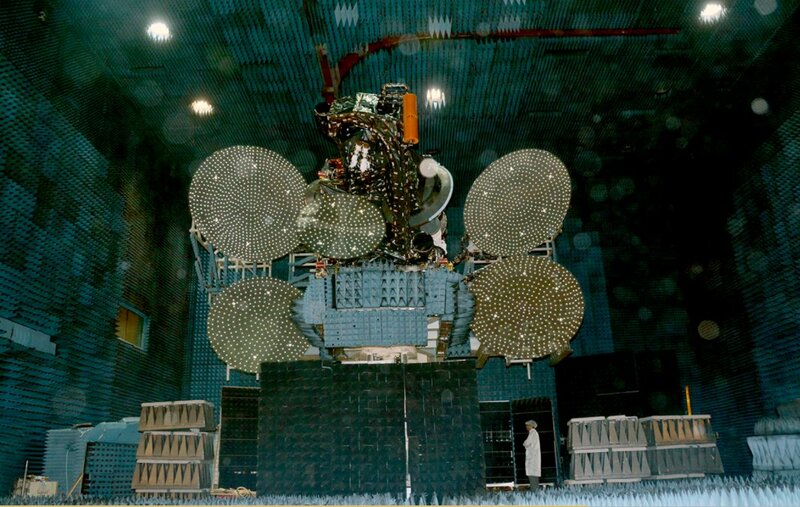 The satellite will provide replacement and expansion coverage for AsiaSat-4, responding to growing demands in the Asia-Pacific Region. 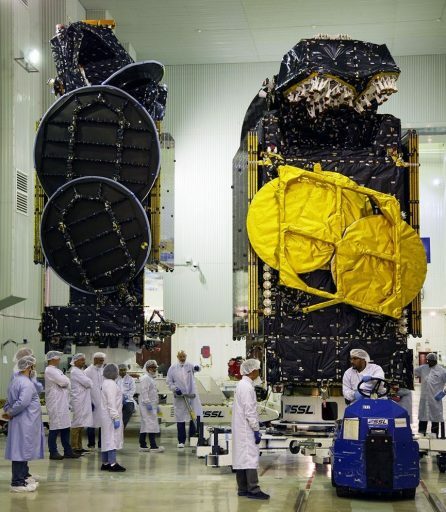 AsiaSat 9 hosts a tri-band communications payload of 28 C-Band transponders, 32 Ku-Band transponders and a Ka-Band package. The C-Band system offers the highest transmit power in the region, delivering a global beam for coverage over the Asian continent and Australia while the Ku-Band system delivers focused coverage to China and Australia/New Zealand plus three new coverage zones for Myanmar, Indonesia and Mongolia that were not previously served by AsiaSat 4. Services supported by AsiaSat 9 include Direct-to-Home Television distribution, video connectivity, private networks and broadband services. AsiaSat 9 spent four months in storage while waiting for Proton to return to operations, arriving at the Baikonur Cosmodrome on August 27 aboard a cargo aircraft for a month-long launch campaign. Two SS/L-built satellites greeted each other in the processing hall at Baikonur as Amazonas 5 was deep in its own launch campaign when AsiaSat 9 got started with its own launch flow. A series of tests were carried out at Hall 103A to confirm the satellite was fully functional after its transfer to Kazakhstan. This was followed by propellant loading to provide the satellite with maneuvering propellant for its climb into Geostationary Orbit and a 15-year primary mission. Fueling had been completed by September 15 and integrated operations began at Hall 101 on the 17th with the assembly of the Orbital Unit by installing the satellite atop its Briz-M upper stage and encapsulating the stack in the protective payload fairing. Next, the payload section was transported to the Launcher Integration Facility where the three-stage Proton had undergone assembly and testing. By Saturday, the Orbital Unit had been attached to Proton’s third stage, marking the completion of the integration process. Proton rolled to the Briz-M fueling station on Sunday where the upper stage received close to 20 metric tons of hypergolic propellants to be expended during five main engine burns planned for the mission, tasked with methodically raising the craft’s orbit to drop AsiaSat 9 off in an optimized Geostationary Transfer Orbit. With Briz-M fueled for flight, Proton departed the fueling station at the traditional early morning hour on Monday, being greeted by a colorful sunrise as it rolled to the launch pad at Site 200/39, supporting its second launch in the current calendar month. With Proton standing atop its launch pad, operations went in motion to roll up the Service Structure and begin a detailed testing campaign on the launch vehicle followed by preparatory steps for an 11.5-hour countdown starting on Thursday to set up for a nighttime liftoff. The first order of business once the countdown is underway is the activation of the Briz-M upper stage for a final pre-launch check and the upload of the flight software, holding all the instructions for the upper stage’s nine-hour mission. Proton-M will complete activation at around T-7 hours and non-essential personnel will depart the launch pad for the hazardous propellant loading operation. Starting at T-6 hours, Proton-M enters a three-hour propellant loading sequence to receive some 622 metric tons of toxic Unsymmetrical Dimethylhydrazine and Nitrogen Tetroxide. The pad is re-opened after fueling to enable engineers to remove protective covers from the rocket and finish close outs of the launcher and ground facilities. The Service Structure rolls back at T-1 hour and teams will evacuate the launch zone as the Master Countdown Sequence gets underway. The insertion of the launch key at T-5 minutes will mark the start of the automatic countdown sequence to transition Proton to internal power, pressurize the tanks and hand control off to the launcher at T-1:53 for a final automatic health check prior to ignition. Proton comes to life at T-2.5 seconds with its six RD-275M engines firing up and initially going to a 40% thrust setting before throttling up to a collective thrust of 1,014-metric-ton-force and lifting Proton off the ground when overcoming its launch mass of 712 metric tons. 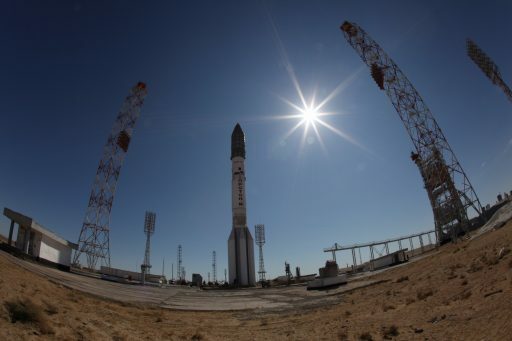 Climbing away from Site 200/39, Proton will rise vertically for just ten seconds before initiating its pitch and roll maneuver to attain a north-easterly heading, departing Baikonur on a 61.3-degree launch azimuth taking the vehicle toward the Russian border. The vehicle will pass Maximum Dynamic Pressure at the one minute mark, burning 3,500 Kilograms of propellant every second of powered flight. The first stage will exhaust its 419-metric-ton propellant supply one minute and 59 seconds into the flight when the hot-staging sequence will kick in. 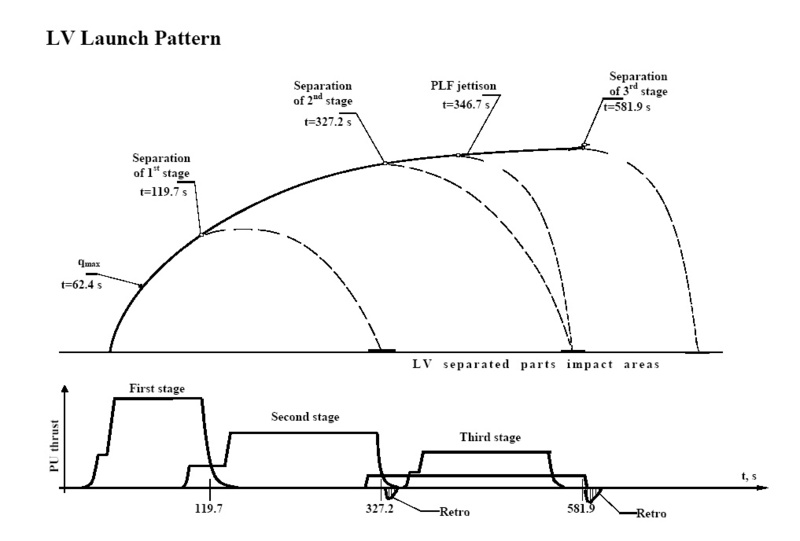 Stage 2 will be commanded to fire just as the first stage shuts down its engines and pyrotechnic separation devices fire to severe the structural connection of the 21.2-meter long booster. Firing its four 599-Kilonewton RD-0210/0211 engines, the second stage will burn 156 metric tons of propellants over the course of a three-minute and 28 second burn, boosting the vehicle out of the discernible atmosphere. The 14.5-meter long second stage will also depart the vehicle in a hot-staging mode, starting at T+5 minutes and 24 seconds when the third stage will fire up its four-chamber vernier engine followed by shutdown and separation of Stage 2 three seconds later. Another three seconds later, the third stage ignites its 583-Kilonewton RD-0213 main engine on a four-minute boost. The payload fairing will split open and drop away from the vehicle twenty seconds into the operation of the third stage, shedding around two metric tons of no-longer-needed weight as the delicate satellite structure can no longer be harmed by aerodynamic forces. Consuming 46.5 metric tons of propellant, the rocket’s third stage will shut down its main engine nine minutes and 31 seconds into the flight with the vernier continuing to burn for another ten seconds. At T+9 minutes and 42 seconds, the orbital unit will be separated onto a sub-orbital arc. Assuming control of the flight, the 22-metric-ton Briz-M upper stage will coast passively for 94 seconds before firing up its S5.98 main engine, generating 2,000-Kilogram-force of thrust. The first burn, planned to be 4 minutes and 20 seconds in duration, will transition the vehicle from a sub-orbital trajectory into a Low Earth Parking Orbit of 168 by 179 Kilometers, inclined 51.6 degrees for half an orbit of coasting so that the second burn can occur on the ascending node of the orbit. 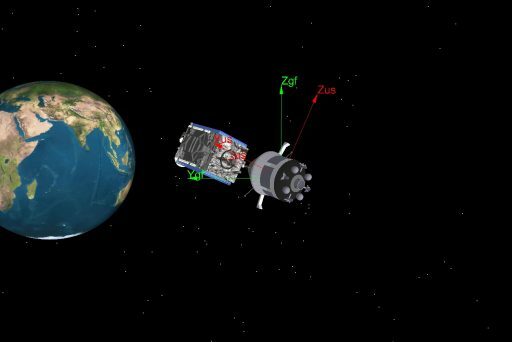 The second burn of the Briz-M upper stage is expected to be 17 minutes and 52 seconds in duration to raise the apogee of the orbit, targeting a 270 by 5,000-Kilometer transfer orbit peaking over the equator. Next is a coast phase of nearly an entire orbit so that the next burn can again take place around the perigee of the orbit, on the next ascending node, to continue raising the apogee to reach the desired altitude of 35,805 Kilometers. The third and fourth burns are conducted as a pair, amounting to a total of 17.5 minutes, only separated by a brief coast during which the spent Auxiliary Propellant Tank is jettisoned from the Briz-M after its propellant load of 14,600 kg is depleted. After the conclusion of the fourth burn, Briz-M will coast for five hours to be able to climb all the way up to the apogee of the orbit for the final burn of the mission that serves as a perigee-raising maneuver and a plane-change, reducing the inclination of the orbit. The fifth burn is planned to be six minutes and 14 seconds in duration, targeting a start time of T+8 hours and 53 minutes. Spacecraft Separation is expected 9 hours and 13 minutes after liftoff into an orbit of 4,045 by 35,786 Kilometers, inclined 23.4°.